m a y f i l e s . . .: Riding on 2 Wheels! The following scenario has played out at about 3 month intervals for the past 18 months. 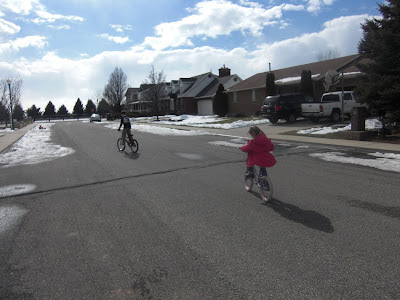 Ellery: Dad, pleeeease take off my training wheels. I can ride a 2 wheeler. I really can Dad. I'm not scared. The training wheels are then removed. Followed by a 30 second attempt. Five minutes of tears. Ten minutes of pleading for the training wheels to be put back on. On they go. And 3 months later we repeat it all again. 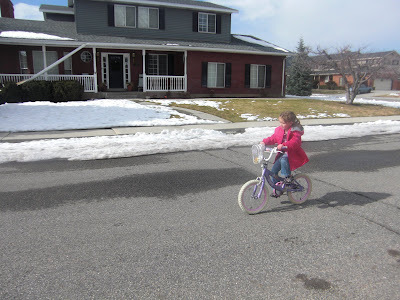 We can now proudly announce: Ellery is riding a two-wheeler. She has joined the ranks of the big kids. Too bad it is going to snow all next week.